Enjoying the city by bicycle. Where there are bicycles there is life. The bicycle has a variety of purposes. It can be used for sport and recreation or as a means of transport. But it is also a way to connect with people, the community and the environment. This is how I imagine a cyclized city to be. So really, this video is meant as a celebration of urban living. The bicycle has the potential to be a tool that enhances and amplifies that urban experience. It’s time to assume that there are other people who want to enjoy the benefits that a cyclized city brings. It’s time to assume that there are others who are willing to be sold on the benefits that a cyclized city brings. It’s time to be inspired and be inspiring. No cyclist here; just a person on a bicycle, on a bridge. Roads are for everyone and road rules were made for all road users. Then modern cities arrived and urban sprawl was born. And along with a house in the ‘burbs came the promise of fast and cheap car commutes and demands for affordable parking. So even though the road rules have remained the same, the urban landscape looks and operates very differently. Cars are the norm. They dominate our cities. But things are changing. Although most of our politicians seem to have misplaced the memo, cars are not turning out to be the panacea that they were once intended to be. Increasingly, there is talk of – climate change, active transport, ‘urban density done-well’. Demands for alternatives to the long-haul car commute will continue to get louder. Happy people live close to where they work and play, apparently. We are starting to witness a ‘conflict’ of ideas. How do we want our cities of the future to be? Is the current model sustainable, resilient or desirable? And it’s important to reiterate that it’s not actually all about the cycling or being anti-car even; it’s about making cities for people the top priority. And just because we can’t imagine our cities being fully functioning without the car being centre stage, that doesn’t mean it isn’t possible or that changes shouldn’t be made. That’s why it’s so important to be taking inspiration and ideas from cities around the World that have already made the transition. Within a context of cities being designed for cars and motoring being made so accessible and privileged, it’s easy to see how the bicycle has come to be the fall guy. 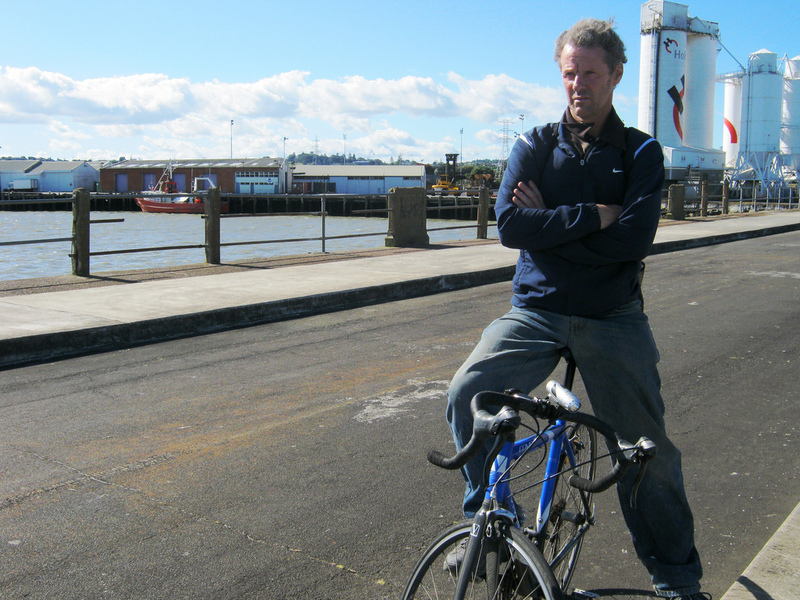 Bicycles, as a transport form, don’t cut the mustard. In the current inCARnation of our cities, bicycles were never going to be able to (nor should they have been expected to) compete with cars or public transport over longer travel distances. Some people have managed to make the switch from the car to the bicycle for their long distance commute. However, the failure of cycling to be seen as a serious transport option, is evidenced in the lack of people willing to take on this brave, but ultimately fear-inducing form of transport. At the same time, the role of the bicycle as the perfect tool for short, local trips (the wheeled pedestrian variety – e.g. from home to a nearby train or bus station) has been largely overlooked. Bicycles exist in a kind of twilight zone. So the road rules clearly state the expectation that bicycles are to be treated like two-wheeled motorists. They are entitled to claim the lane and must also follow all the road rules that motorists are obliged to follow. But apart from the few brave souls already mentioned, the remainder of the population (if they choose to ride a bicycle for transport at all) is more likely to ride a bicycle at a slow, comfortable speed over much shorter distances. (Cycling to school comes to mind). But in reality, cyclists are neither cars or pedestrians. 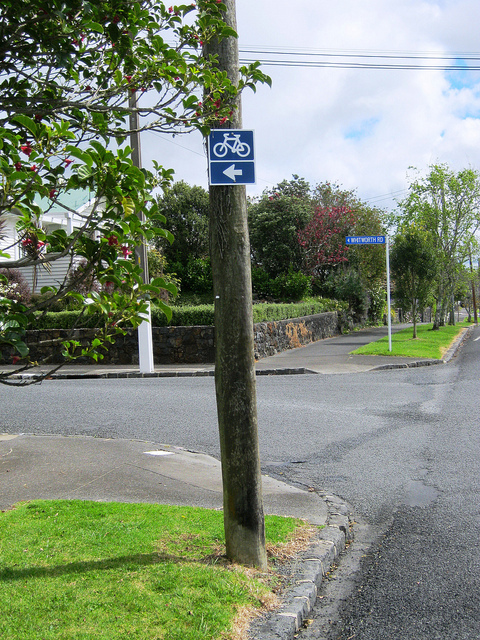 The road rules are also very clear in that people on bicycles are not allowed to be on the footpath. That is the domain of the pedestrian. It always amuses me how pedestrians and cyclists will fight it out for some scraps of space on the side of the road, while the motorist remains largely ignorant of the conflict going on on the periphery. (Full disclosure: I will always defer to the safety of slow riding on the footpath if my real or perceived safety feels compromised). So, while motorists rule the roost and pedestrians are accorded a modicum of space and respect (which may be due to the fact that all motorists are pedestrians – but not all motorists are cyclists), cyclists live in a parallel World. Unsure, uncategorised and not particularly welcomed anywhere. This phenomenon is witnessed daily – on the roads and in the media. Fortunately for us, the hard work in understanding this situation has been done for us. Not only are cyclists an outgroup, they’re also a minority outgroup. Moreover, they are engaging in an activity that is deemed slightly inappropriate in a culture that views driving as normative and desirable and, arguably, views cycling as anti-conventional and possibly even infantile. A. “I just saw a cyclist go through a red light”. B. “Yeah. Bloody cyclists! They always do that”. The outlier status of cyclists means that drivers will tend to blame poor behaviour of some cyclists on all cyclists. Further to that, and speaking from personal experience, cyclists are more likely to be making (what is perceived to be) poor decisions or breaking the road rules in order to keep themselves safe. Because you have to remember, our cities have been built for cars, not people or people on bicycles. And according to the surveys, a healthy majority of people say they would ride a bicycle “if it was safe to do so”. So while the research is unequivocal; cycling is a worthwhile activity and should be encouraged, there is still limited impetus to take it too seriously as a form of transport. We are still too conflicted. The car still dominates transport policies and budgets. Sprawl is still being provided as the solution to a housing shortage. In the meanwhile, we continue to focus on training cyclists to stay safe around cars and encouraging obedience to the road rules. Back to Dr Ian Walker, on the issue of “all cyclists should wear hi-viz” argument. (You know, the argument favoured by the New Zealand coroner). …there are other reasons to be suspicious of high-visibility gear, not least that it transfers responsibility from the driver of the metal box that creates the danger to the victim of that danger. seeking a consensus that supports prioritising the moving of people safely ahead of the moving of high car volumes. designing our city streets and promoting transport policies that are people and bicycle friendly. promoting cycling in a way that makes cyclists less an unpredictable “out group” and more an integral part of the urban transportation fabric. Anything less is merely tinkering around the edges. What a good looking bunch – of bicycles. 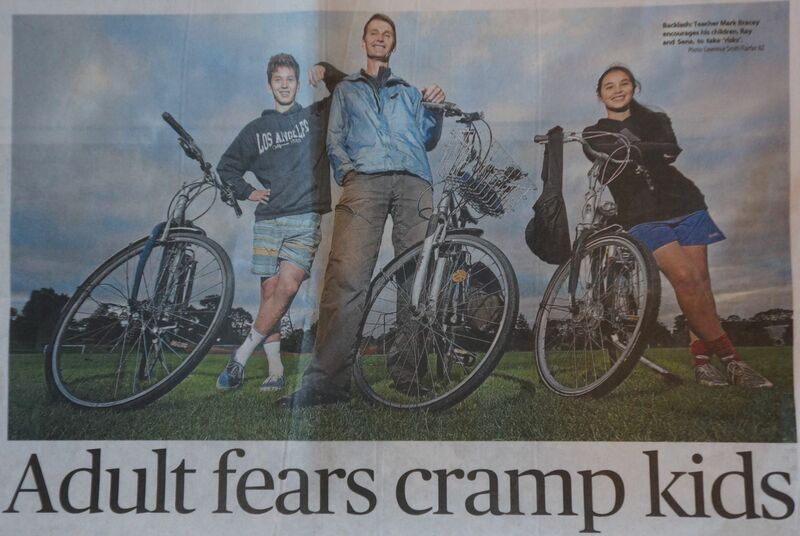 I got to talk to the media last month about two of my favourite topics: raising children and riding bicycles. As I indicated previously here, those two things overlap a lot in our household. The article was about how children are now growing up in a social environment that is far more constrained than in previous decades. I see it in my school setting. I see it in my community setting. The sense of freedom and independence that previous generations enjoyed, is being lost. Over recent decades, a child’s zone of play has shrunk considerably. Children are spending more of their free time stuck inside the house, rather than outside exploring the world. We also know that they are being ferried to and from school by car much more than they used to be. I learned at a young age, that life looked very different from behind the handlebars of a bicycle to that of the windscreen of a car. Modern transport has the ability to annihilate space. So I have tried to impart that experience to my own children. I have tried to give them the chance to play independently, travel independently and be independent in their thinking. Making mistakes along the way is a great pathway to making good choices. Falling out of trees, falling off bikes, experiencing conflict with friends is all part of that process. I fear that the first time young people get to experience risk-taking is when they are put behind the wheel of a motor car. From Grand Theft Auto to hooning down the motorway, with no in-between steps. Modern economic imperatives have to take some responsibility for this situation. Many parents now have no choice but to ‘drop their children off and run’. They have jobs to go to. Bills to pay. And even if money is not the issue, all that work is going to mean they are time-poor. But there is still a lot of ‘cotton-wooling’ going on. I see it in the school playground. The prevalence of adult intervention in playgrounds is not always beneficial to the children. Unfortunately, the down side of the article was the way in which it played into the refrain, ‘riding a bicycle is risky’. As a result of the article, I got a not-so-gentle ribbing from my brother-in-law, for being a ‘risk-taker’. “Yeah, right! ?” were his words. He knows me as being considerably risk averse. And he’s right. I am. So how is it that someone so risk averse as myself uses a bicycle on a daily basis and is happy to encourage his own children to do the same. It’s about assessing what risk there is, and dealing with it appropriately. That’s the learning our children are being deprived of. Riding a bicycle should not automatically imply hurtling oneself down a tree covered hillside on a mountain bike. That’s risky behaviour. And I fear that that is how the non-cycling public perceive cycling to be. This is my version of cycling-I mean ‘riding a bicycle‘. And that’s why it’s so important that the self-appointed promoters of cycling take care that their messaging is spot on.